Jared Rosholt might not have the most exciting fight style on the UFC roster. But at UFC 193, his game plan was effective. Rosholt smothered Stefan Struve over the first two rounds of their heavyweight main-card opener, which was enough for the former NCAA All-American wrestler out of Oklahoma State to get the nod. The judges’ scores at Melbourne’s Etihad Stadium were 29-28 across the board. In the opening round, Rosholt took the 7-foot-tall Struve down early and kept on him for the bulk of the round. The second round was a repeat performance, though Rosholt never came close to finishing the fight from top position. Struve, who seems clinically incapable of capitalizing on the strengths his size and reach seem to afford him, finally tried to put it together in the third round, keeping it standing most of the round and landing several solid kicks. But another Rosholt takedown late sealed the deal. 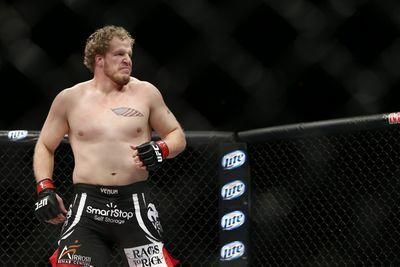 Rosholt (14-2) has won three in a row and is 6-1 in the UFC. Struve (26-8) has dropped three of his past four.